Though the concept of European-style canal voyaging seemed unusual to us at first, our recent trip on French Country Waterways' 12-passenger Nenuphar was a blend of traditional cruising and something completely -- and delightfully -- different. Nenuphar's elegant decor and superb service reminded me of the finest country house hotels in which I've stayed. Of course, this hotel floats. Albeit slowly. This is not a frenzied, port-a-day, world-famous sights sort of travel experience. 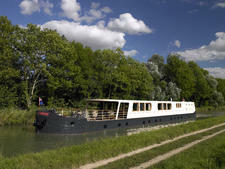 Our barge, which meandered through the canals of France's Loire Valley, moved at a smooth five miles per hour. Sometimes it didn't (move). As it must pass through innumerable locks, there were times when Nenuphar simply sat patiently, waiting for the lockmaster to return from lunch, before it could pass on through. Ultimately, our days offered not only enough activity -- a half-day ship-organized shore excursion (included in our fare) and even a hot air balloon ride (for an extra fee), but also time for recreation and relaxing meals -- and always time for a nap. Nenuphar is one of a fleet of five hotel barges (that will expand to six this fall when the custom-built Adrienne joins the family). 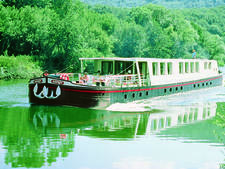 The cruise line is fully owned and operated by Massachusetts-based French Country Waterways. 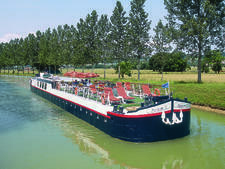 The family-owned company-in its second generation of operation-oversees all aspects of the voyages on its hotel barges, whose passenger capacities range from a low of 8 (the newly revamped Horizon II) to a high of 18 (on Esprit). Some might consider the small passenger capacity a disadvantage; all thrown together, morning, noon and night on this cozy vessel (there were just ten of us), groups could potentially be less than harmonious. On our trip we were pleasantly surprised as our voyage's disparate folks -- half from Canada and half from the U.S. -- became famous friends. But staffers told us they have techniques for passengers that don't jell as easily (and chartering Nenuphar is an outstanding option for groups of friends or families). 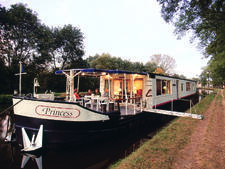 A major plus is French Country Waterways' genuinely all-inclusive policy. Included in the cruise fare are all drinks, including wine and cocktails, plus shore excursions (though a hot air balloon ride was an optional extra) and a transfer from a central Paris meeting point to and from the barge. The only extra charge was the gratuity. Another high point: service was outstanding. The high ratio of staff-to-passengers (two of them for each one of us) meant that no request was too much trouble, from spontaneously arranging a half-day tour of a pottery factory to serving cocktails (even the captain would jump in and pour). We only sailed during the daytime, as locks weren't operated after 7 p.m. That meant that each night we docked at a variety of small French towns and villages -- places that don't even exist in guidebooks. This is not a negative for anyone who's ever wanted to experience life beyond France's tourist track. Indeed, this trip was all about indulging in life's small pleasures: a peaceful morning spent at a cafe, sipping coffee and eating baguettes; a lazy and decadent lunch with French wines on the ship's covered terrace; a languid bike ride along canal-side towpaths (where even your moderate excursions outpace that of Nenuphar). One caveat: Because the ship must arrive at canal locks on a certain schedule, the itinerary wasn't at all flexible. It was hard to do anything spontaneously (such as make a foray into a nearby village or extend a shore excursion to include wandering-around time) but by the end of the trip we'd figured out how to time it -- and would take off on Nenuphar's bicycles and meet the barge at a pre-arranged time further down the line. Ultimately, as a respite from the too-busy life that we all seem to be enduring these days, our six-night trip on Nenuphar came as close to perfection as any cruise we've ever taken. On our voyage, passengers were primarily in the 45-plus category, well-traveled, sophisticated yet down to earth, and both physically and intellectually active. This would be a difficult option for physically disabled travelers as there are no elevators, and stairways down to cabins are steep. During shore outings passengers dressed in smart resort casual clothes. Onboard, day times were quite casual while evenings were resort casual. The company recommends passengers tip approximately 5 percent of their cruise fare (which means about $180 - $360 per person). Service on our trip was so good that most passengers on our trip tipped above the minimum. Plan to tip with traveler's checks (U.S. dollar and euro are fine) or with cash (again, U.S. dollar or euro is accepted). Credit cards are not accepted.